Soulsurfing – Movement and Composition by Jason Swain. Continuing my recent theme of trying to create surfing photos that have a little bit more to them, some sense of the time and place they were taken. 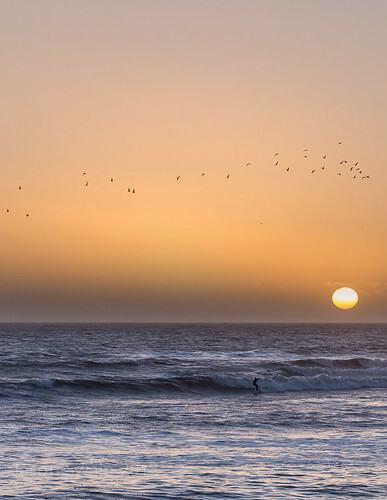 A silhouetted flock of passing guls, a setting sun, a lone surfer up and riding. I like how everything is moving in different directions, all at different speeds, but for the purposes of this photograph, they have all become one and there feels like a connection. It’s another one from Wednesday (30th Jan 2013) evenings photo-shoot at Freshwater Bay. Local surfers Ian Pacey and Matt Harwood having a quiet sunset surf as the windy conditions that had been around all day messing up the swell, eased off just enough for a few cleaner waves to sneak through. Two frame Vertorama, shot with the Sigma 50-500mm telephoto lens (at 167mm) on a Canon 6D body. Exif data = f/5.6 at 1/200, ISO 200. Soulsurfing – Movement and Composition, originally uploaded by s0ulsurfing.